The AmRRON network has added a County Status Report Form (STATREP) . The County Status Report is a new type of message form designed to simply and efficiently report conditions within a county to the appropriate authorities. The FLMSG custom form is available at www.AmRRON.com and can be imported into your NBEMS Custom Forms Folder, which opens in html in a web browser for viewing, editing, and printing. If the operator is unable to access or use the custom form above, the following format may be used to give the report via voice, text, Winmor, etc. For more details about the lines and appropriate responses to each, see the list below. Have the report filled out and prepared prior to attempting to send the STATREP. What is a County Status Report? Addition of line numbers to facilitate line item Voice or Text reporting when the custom html form cannot be used. 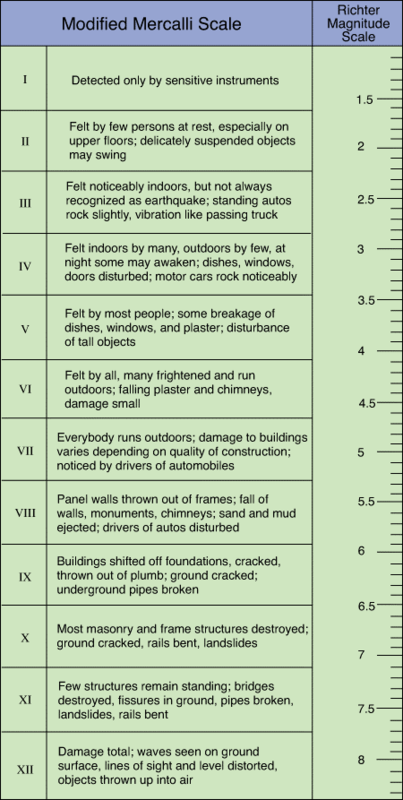 The addition of the Modified Mercalli Scale for reporting damage or effects felt from earthquake or major explosion. Radiological Reporting for operators with radiation detection equipment, when applicable. City/County/State. Often times a station operator may not know what grid square he is in, especially if he has been forced to relocate, or is deployed to an unfamiliar area. However, he almost always knows what city (and possibly county) and state he is near/in. The county status report is a new type of message designed to simply and efficiently report conditions within a county to the appropriate authorities. The report covers the status of a number of important public services in the referenced county. It uses a standardized system to report status ensuring consistency in reporting. Data used in the report can come from personal observation or from personal observations collected by other MARS members, amateur radio operators in ARES or RACES groups, or knowledgeable individuals. Specifically, the County Status covers the Operational status of Public Power, Water, Sanitation, Medical Care, Transportation and Communications systems. LINE 5: FIPS Code (zip code with 0 zero placed before zip code) if known use the five digit FIPS code and add a leading zero for compatibility with the NWS SAME code. An example of the FIPS code for Bexar, Texas is 48029. The STATREP form would be sent using 048029 which is also the NWS SAME code for that county. R – Rolling Blackout. Planned outages with little warning intended to ease stress on the power grid. P – Partial Blackout. Unplanned interruption of commercial power only in parts of the county. B – Brownout. Reduction in voltage used as an emergency measure to prevent system failure. N – No. A Blackout has occurred. Complete unplanned commercial power interruption in the county. Y – Yes. Fully functional water service in the county except for routine maintenance. (Green). P – Partial. Unplanned interruption of water service only in parts of the county. C – Contaminated. Water service is available but contaminated and should not be used. N – No. Complete unplanned water service interruption. Y – Yes. Fully functioning sanitation service in the county except for routine maintenance. P – Partial. Unplanned interruption of sanitation service only in part of the county. N – No. Complete unplanned sanitation service interruption. Y – Yes. Fully functioning and staffed hospitals and clinics with spare capacity available. P – Partial. Unplanned decrease of capacity in the county due to loss of facilities. R – Partial due to personnel. Unplanned decrease in capacity due to loss of personnel. F – Full. Facilities are at maximum capacity and can’t handle new patients. N – No. Not available. Medical facilities are unusable due to loss of personnel or infrastructure. Y – Yes. Fully functioning commercial and civil government local communications. P – Partial. Commercial communications out but local government communications are operational. N – No. Complete loss of local communications and government communications. Y – Yes. Fully functioning mass transit, roads, and rail systems except for routine maintenance. P – Partial. Unplanned interruption in service or loss of road/rail in parts of the county. N – No. Complete loss of mass transit systems. Roads remain available except for those damaged. C – Commercial Broadcast. This includes non-validated sources such as local radio and TV news. E – EAS. Government Broadcast. Information received from EAS/IPAWS over any media. G – Civil government or public officials other than EAS/IPAWS such as from an EOC. A – Amateur. Information originated by amateur radio operators and not validated or coordinated by public officials. R – Relay. Information originated by civil government that is subsequently relayed through amateur radio. A dash or hyphen symbol, – is used if no source is required based on the fact that nothing negative is reported. If no source is required since nothing negative is reported, the field should be filled with a “- “. Basically, if all other Fields have a “Y” (Yes) answer, then quoting a source is not required. When a problem in an area exists and any entry other than a “Y” is entered, then a source must be cited. This provides a way to confirm or trigger other events that may provide support to an area. 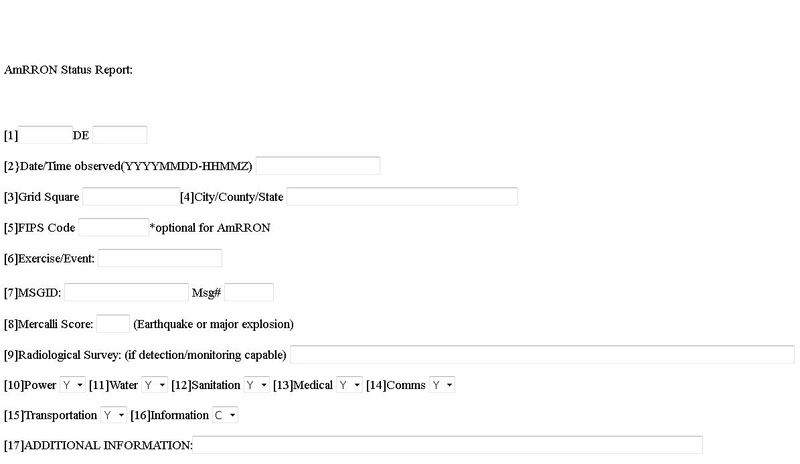 A typical use of the “Additional Information” (Remarks Field), would be to spell out the county name, place the reporting station call-sign, or list the organizations name or source of information.